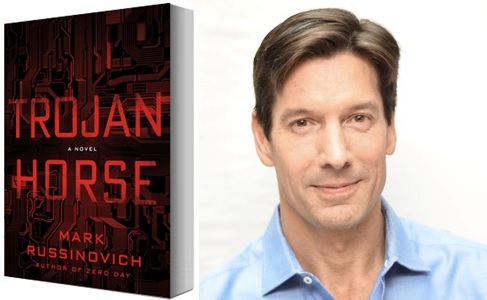 Enjoy Mark Russinovich technical fiction – adventures in cyberspace. Plus, all this from a guy who has written some amazing software, as well. I am a great fan of fiction that provides learning as well as distraction. For many years, Michael Crichton was my favorite author, until his untimely passing ten years ago. I particularly enjoyed his State of Fear. More recently, my technology fiction fixes have come from folks like Neal Stephenson, Charles Stross and Daniel Suarez. Time now for me to tip my hat to Microsoft executive Mark Russinovich. This guy is Chief Technology Officer at Microsoft Azure and is deep into all things cloud. But his three fiction works – Zero Day, Rogue Code and Trojan Horse – are action adventures with a deep computing side. Two computer consultants – Jeff Aiken and his romantic partner Daryl Haugen – are chief protagonists in these adventures. Each story goes deep into the mechanics of cyber-security and the crafting of cyber weapons. Topics include international and corporate intrigue with the dynamic duo taking on criminals and terrorists. You can read these books for yourself. I think they are quite enjoyable especially if you have an IT bent. Those of you who have maintained Windows computers over the years may have heard of Mark in a different context. He created Winternals and Sysinternals utilities, which he sold to Microsoft in 2006. Most of us have had occasion to use Process Explorer or Process Manager as we dig around in Windows trying to resolve problems. I have found Portmon quite useful for debugging activity of serial ports. Most of these tools started out and remain freeware and have been immensely useful and advanced utilities for exploring the internals of Microsoft Windows. Process Monitor lets you examine real time changes to files, registry settings and Windows processes. Process Explorer is a souped up version of Task Manager. So, all in all, a very interesting guy who has made huge contributions to making life easier for computer technicians. His fiction helps us develop a deeper understanding of cyber-security while having some fun at the same time.